Lately, I've been thinking about loss and home. Not as separate thematic entities, but rather the Venn diagram overlap of the two. These thoughts have been prompted by my move to a new state and region that has also experienced great loss-- economic, cultural, environmental and where connection to home and place is so prominent and visceral. Maybe it's because I grew up in the Midwest, or have lived so many other places, but aside from a dew special places from my childhood, that deep tie to place and state and region is mostly foreign to me. On a recent trip home for my grandma Georgette's 85th birthday, though, I was confronted by my own personal feelings on "home loss" and nostalgia, for a place I can't really return to. My parents and my mother's siblings and their spouses, my brother and his girlfriend, and other extended family, all gathered at my grandma's home, a mostly-retiree condo community that she moved to after my grandfather died. Their house which she moved from sat on 20 acres of woods and pasture in North Liberty, deep in Indiana farm country. My grandparents were a part of that community, but also were a little different, evidenced by their unusual home built on land between cornfields on a country road. My grandfather, a painter, lithographer, and the former art director for Studebaker, designed and built their angular, energy-efficient mid-century modern dwelling, which was tiered with balconies, decks, and the outdoor back "secret stairs" that I liked to take upon my arrival to "surprise" my grandmother who was undoubtedly waiting to greet me at the kitchen window. Their porches and yard were peppered with abstract sculptures, like the sundial "dinosaur" that stood in the center of my grandmother's flower bed, and my grandfather studio, housing his lithograph press, stood just on the other side of the driveway en route to the fishing pond. In Southern culture, literature in particular, there's a lot of talk about "the home place." That concept doesn't appear in the Midwest so much, maybe because so many Midwesterners were migrants with a home place elsewhere-- the south, east, or another country altogether. But that weird house on Riley Road was my home place, where extended family would gather for holidays and big Sunday meals every week of my childhood, and where my brother and I were free to roam, a thrill for us inner-city kids. It's somewhat tangential but relevant, I think, to share that my family had actually been displaced from our original home place-- land I never knew when it was ours, but was the home of my great-grandparents, grandparents, mother and her siblings. That previous property, where my grandfather had also build a house of his own design, was taken away by the state via eminent domain for the creation of a state park that the government had hoped would bring in crucial tourist dollars. It never really did, and I have to wonder if that has something to do with the displacement of the many families who lived there and stayed in the community-- families who were also still obligated to pay the park entrance fee to walk to land that still bears no sign that it was once theirs. Maybe I've absorbed some bitterness about it. Though that doesn't subtract from the connection I felt and still feel to the familial home I knew, it adds another inherited layer to my own sense of loss, and I imagine that feeling is even sharper for my mom and her siblings. One of the things I remember clearly from the home place I knew were the rhubarb plants that lined my grandma's raised bed. They were the biggest rhubarb plants I've ever seen, their toxic leaves almost Jurassic, served as ample shade for the two grey cats, Blue and Pinkie, and were last-minute hiding places for our hide 'n' go seek games at dusk. The edible stalks were bright red and thick-- making the pallid and limp green and pink stalks I sometimes get at the grocery store seem like an entirely different species. The day before my grandma's birthday party, my mom, aunts, uncle, and I had lunch at Georgette's (or as my dad and uncles call her, "Big Gette") house. We made cold cut sandwiches, and after we were done, my grandma apologetically brought a store-bought rhubarb crisp to the table, saying it was store bought because she couldn't find any rhubarb at the store, adding that she's never found any as good as the rhubarb she used to grow on Riley Rd. 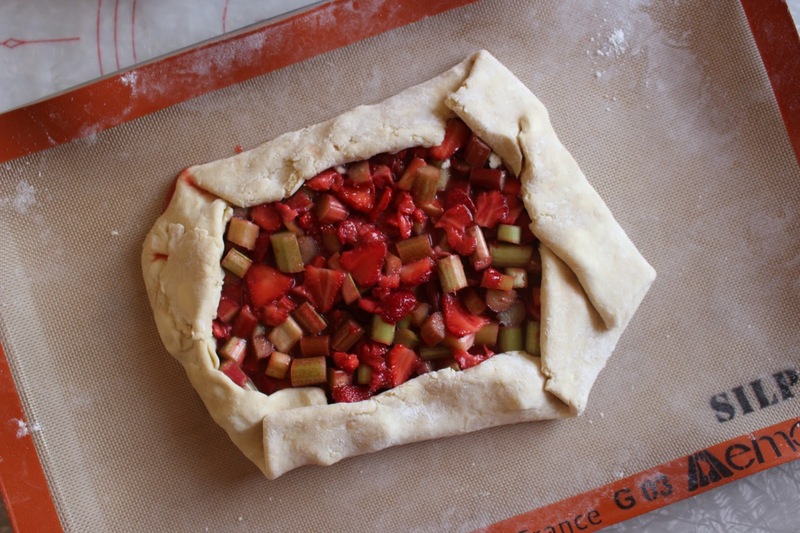 When she served it, my mom and aunt refused a slice, but my uncle, now a Floridian who doesn't come across much rhubarb anymore obliged, and as a ever-rhubarb fan with an ample sweet tooth, I did too. I don't blame or judge my grandma for buying a store-bought rhubarb crisp. Rather, I applaud her for, after long last, allowing someone else to do some work for her- at 85, a mother of 5, and a grandmother of 5, and the family matriarch, she definitely deserves it. The crisp wasn't bad, but it didn't taste anything like rhubarb, the cloying taste of sugar and over-use of preservatives and thickener completely masking any of that biting tartness we were after. But as we sat there chewing, here in a house that despite its cookie-cutie exterior exudes the magic of my grandmother, I realized that what I was tasting was the taste of home and loss, and it was much too sweet. 1. Prepare Nothing in the House pie crust as per the directions here. Chill dough at least 1 hour before rolling out into a 13-14 inch circle on a sheet of parchment paper or a Silpat. Put the rolled crust and parchment/Silpat on a cookie sheet and return it to the fridge while you prepare the filling. 2. 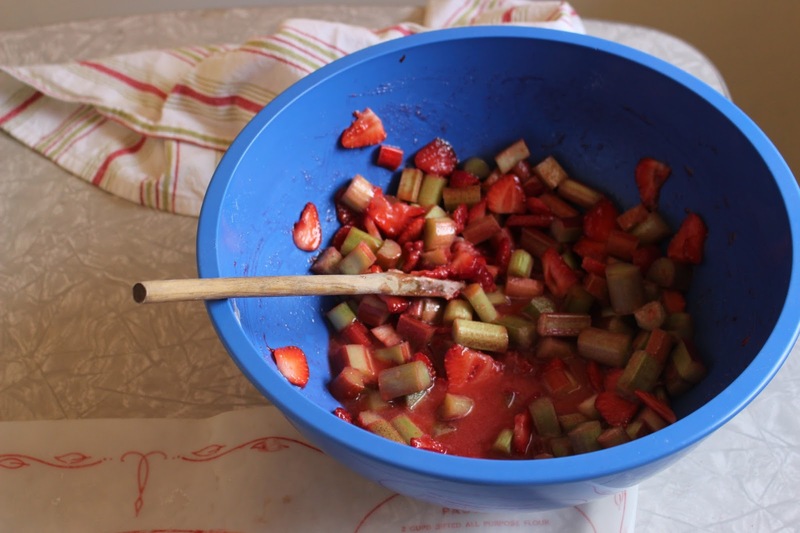 Preheat oven to 400 degrees F. In a large bowl, mix together sliced strawberries, rhubarb pieces, sugar, flour, lemon juice and bitters (or vanilla extract). 3. Remove rolled crust from fridge and spread the fruit filling over the pastry, leaving a 2-inch edge. Fold the edge over the filling, pleating at the corners. Dot the filling with butter pieces. Brush crust with milk and sprinkle with Turbinado sugar. 4. Place the galette in the oven and bake on the middle rack for 1 hour or until fruit is bubbling and the pastry is golden brown. Let cool before slicing into wedges and serving with vanilla ice cream. Thanks for this--the thoughts and the recipe. I've been feelingly similarly lately. Funnily enough, I was in North Liberty this last weekend for the strawberry festival. I moved to South Bend 8 years ago from the west (the mountains part, not the coast part). I was back west about a month ago for my grandmother's funeral, and now that she's gone, that home place is gone as well. Then my grandfather on the other side died, and even though my grandmother still lives on the farm for now, going to the farm for that funeral made me realize that that home place is gone as well. My parents got divorced recently and my mother is trying to find a new place to make the home place, but it's tricky--we get older, and need different things, and it's hard to negotiate nostalgia and the present and the future. Anyway, sadness is too simple a word for the feeling. My grandma also grew rhubarb. 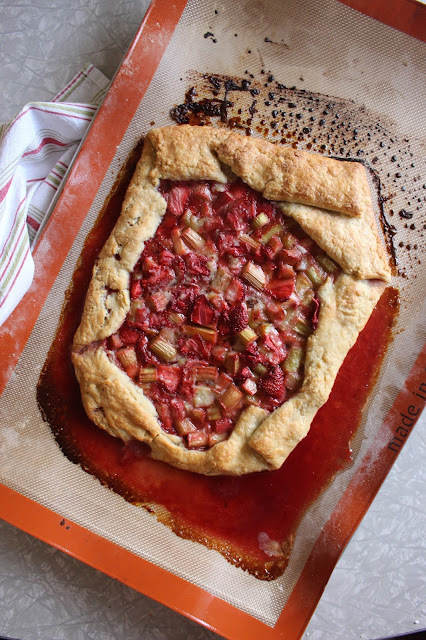 Presuming the farmers market is good to me on Saturday, I'll make this galette this weekend. Wow, such a small world and thanks so much for sharing this-- it means a lot to me. I hope you're able to find some good rhubarb and that it offers a connection to your grandmother and that home place. A lovely piece Emily. You've touched all the senses in this one. Thank you.